Throughout the years many TCDS alumni have gone on to publish in a wide array of formats and medium from academic books and articles to literary fiction and poetry. Others have produced works of art, music, and film. Today we are proud to inaugurate our new column, which features publications by TCDS alumni and friends, with an innovative book by Democracy & Diversity Institute alumna and New School graduate Irit Dekel. Irit Dekel’s new book, Mediation at the Holocaust Memorial in Berlin, offers a novel approach to the memorial and its study through the focus on performances. Based on extensive ethnographic research, and drawing on dramaturgic theory, memory studies and theories of the public sphere, the book offers a fresh theorization of memorial experience by analyzing interaction between guides, memorial workers and visitors. 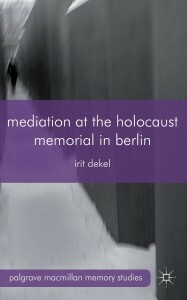 Moving away from models of post-memory and post-trauma approaches, the book recognizes the precariousness and variation of memory work done at the memorial through the ways visitors engage with the act of remembrance rather than with its object, namely the history of Jewish persecution and the Holocaust. This engagement explores how visitors present and perform their ‘moral career’ at the site, whose codes have been shaped by knowledge about and visits in this and other sites of Holocaust remembrance. Irit Dekel is a 2002 Democracy & Diversity Krakow alumna. She is currently a Research Fellow at the department of Social Sciences, Humboldt University of Berlin and visiting faculty at Bard College Berlin. She studied political transformation at the Holocaust Memorial in Berlin in 2005-6 with the support of the DAAD research fellowship and with a Fritz Thyssen Foundation stipend and earned her Ph.D. in Sociology at the New School for Social Research. She has published on memory politics in Germany and Israel, media, memory tourism, and is a regular contributor to the Public Seminar. Whether it’s your latest article published in an academic journal, or maybe your latest album released on CD, we’d like to feature it here. For more information on qualifications, as well as instructions on how to submit, please see our previous post here.